Martha’s Vineyard Family Campground is the only campground on Martha’s Vineyard. It’s in the perfect location to explore all that this iconic vacation retreat has to offer. And, it’s extremely affordable too. The Campground, which offers, tent, cabin, and RV camping is perfect for families and kids. It has a playground, ball field, basketball court, and recreation hall. There is also a community fire ring with plenty of seating for the adults to relax and meet other campers too. The campground was created in 1972 and has many visitors who return to vacation there every year. The campground season begins in mid-May and lasts until mid-October. And, the rates are very fair and far cheaper than the cost for a room at a bed and breakfast or hotel on the island. We loved our stay at Martha’s Vineyard Family Campground and we think you will too. You will love setting up your rig, tent or cabin and then never having to break camp to go sightseeing around Martha’s Vineyard. The island’s shuttle bus service stops at MVFC every 30 minutes. The Shuttle has 9 bus routes and the shuttle buses go everywhere on the island. So depending on where you want to go just jump on the correct shuttle and off you go. And the shuttle buses have a bike rack on the front. We just loaded our bikes onto the shuttle bus and off we went to visit Edgartown and Oak Bluffs and a few other sites too! The shuttle bus prices were very reasonable. The shuttle is only $8 for one day, $18 for 3 days, or $30 for 7 days, and it goes all over the island. You can buy any of these passes right on the bus but you need exact change because the bus drivers can’t make change and they don’t take credit cards. You can also buy bus passes to go from one town to another for as little as $1.25. We liked the daily pass option so we didn’t have to buy a pass every time we boarded the bus and we could roam the island conveniently. The buses were also a great resource for finding cool and interesting places to go on Martha’s Vineyard. We met many locals while riding on the buses. They were the nicest people who gave us great suggestions for restaurants, bars, coffee shops, attractions and all kinds of ideas for fun things to see and do. We even met Mike Haydn, the Martha’s Vineyard resident who played his guitar on the beach during Jaws’ opening sequence, and he helped us to get our bikes off of the bike rack on the front of the bus! The campground is very well kept and quiet and peaceful. It’s heavily wooded with a mixture of oaks and pine trees. There are a variety of campsites that are available too. The campground has 100 Tent Sites, 27 Cabins, 26 Seasonal RV Sites, and 20 Daily or Weekly RV sites. We biked all through the campground and saw that the campsites are a good size and heavily wooded. We had a beautiful campsite surrounded by pine trees that was secluded and peaceful. The campground itself was well organized and the staff was friendly and helpful. The camp store sells firewood, food items, and camping accessories. The bathrooms, laundry and recreation rooms were all nice and clean. There is an area for a community campfire and the campground is perfect for a family vacation with kids. Below is a google earth image that shows how wooded the campground is. You can’t even see the campsites through the trees. And the map also shows the bus stops right at the front of the campground. “Great Way to Visit Martha’s Vineyard – Our family spent 5 nights tent camping here. We have two young daughters and they enjoyed our site’s proximity right across from the playground and athletic field. There is a camp store which is well stocked with some basics like firewood and cooking accessories. There is only one set of bathrooms and they are a bit tight space-wise, but the outdoor showers attached to a separate building are a nice addition. We had our car which made it easy to explore the island. I think it would be nice to visit with just bikes, but this could be tricky with small children. There is a rec room with a ping pong table, air hockey, and video games, but the equipment needs some updating. You might get a kick out of it as a throwback to another time, but not much of it works. In spite of this, it is apparent that the camp is quite well maintained, and you can see employees working hard on it every day. Most sites have water and electricity so you might spot some campers with a microwave or toaster oven! There are lots of things to see and do on Martha’s Vineyard. We can’t possibly list them all but here are some of our favorites! See the Gingerbread Houses at Oak Bluffs – There are over 300 privately owned cottages that make up this amazing village within Oak Bluffs. We rode our bikes all through the grounds and were amazed at the level of detail on each of these gingerbread-style houses. There is also a museum cottage you can tour through if you want to see what they are like on the inside. Visit Edgartown – Edgartown is a gorgeous community of restored houses from the 1800s. We took the bus there and then biked all over this town looking at amazing architecture and landscaping. The Edgartown Lighthouse is a popular spot to snap a picture. You can also take a tour and go to the top of the lighthouse. Spend the Day at South Beach – South Beach is also known as Katama beach. It stretches along the ocean for 3 miles with beautiful sand dunes. The beach sand is beautiful and the water is blue here. It’s a really pretty beach. There is plenty of parking there but many folks just ride their bikes from Edgartown to the beach. Eat a Donut – After a night of partying, grab a mouthwatering Back Door Donut in Oak Bluffs which is at the back door of Martha’s Vineyard Gourmet Café & Bakery. By day it’s a restaurant but at night, a “crew of 10 keeps making the donuts until 1am” and they sell them at the back door. You might have to wait in line for a bit but the wait is worth it. Check Out Chappaquiddick – You can take the ferry from Edgartown to Chappaquiddick where you can visit the Cape Poge lighthouse or the Mytoi Japanese Garden. If you are looking for a remote beach location you should consider East Beach on the Wasque Reservation. It’s a bit of a trek to the eastern shore of Chappaquiddick from where the Chappy Ferry drops you off, so not many travelers make the trip. Because of its location, this stretch of sand is relatively empty, making it a great spot to observe the birds that call this area home. 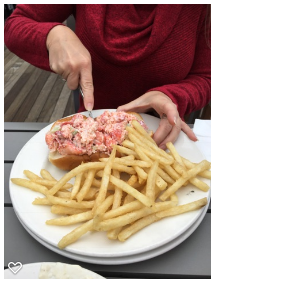 Have a Lobstah Roll – We stopped at The Seafood Shanty which is right on the water to try out a Lobstah Roll. Now we are from Maryland hun, so it’s really hard to top our famous blue claw crabs! So, while most people rave about the Lobster Rolls we prefer our tasty crab cakes with Old Bay seasoning. There is no seasoning in Lobster. We got the cold lobster roll but they also serve a warm lobster roll with butter. The view is gorgeous on the deck upstairs. Just walk in and take the steps up. They have a lively bar and plenty of tables to enjoy a great meal and enjoy the view. Long Point Wildlife Refuge – Beaches, marshes, woodlands, and freshwater ponds make up the 632-acre Long Point Wildlife Refuge. Long Point is home to many rare plants and wildlife that are suited to its dry landscape and brackish waters. You can explore the refuge along a 2-mile hiking trail which goes through the forest, salt marsh meadows and along the beachfront. You can swim in salt and fresh waters here and kayaks and paddleboards are also available for rental. Vineyard Haven – Vineyard Haven is one of the two ferry locations on Martha’s Vineyard. The town is beautiful and the harbor there is so picturesque. We were able to get some really pretty pictures of the boats floating in the harbor. The Black Dog Tavern is really well known for their baked goods. Grab something for the ferry ride! A four-day food and wine festival that celebrates local chefs and world-class wines. A celebration of spring and Mother’s Day organized and sponsored by the Edgartown Board of Trade. Includes a festive decorating of the Edgartown Lighthouse, shopping and dining specials, and activities and entertainment for the whole family. Island vendors, nonprofits, and artisans gather along the harbor to celebrate the arrival of summer. The kid-friendly festival offers live music, art, crafts, food, and summer-themed festivities for the whole family. A weekend of feature films and musical performances that celebrate the convergence of music, culture, and film. A longstanding tradition on Martha’s Vineyard, beginning in 1956. Artists from all over the Island, both professional and amateur, display their creative works and compete for awards. The show provides a festive atmosphere with an opportunity to purchase fine art and meet Island artists. See the Campground aglow for the Grand Illumination, a special highlight of the summer season. The cottages of the Campground are adorned with colorful Chinese and Japanese lanterns, and both a Community Sing and a band concert are held in the Tabernacle. A three-day festival celebrating jazz and blues on Martha’s Vineyard. Four days, three nights of unique-to-the-Island dining experiences. Rooted in the Island’s rich tradition of farming and fishing, this festival invites you to meet local culinary talent, and the farmers, fishermen, oyster producers, and artisans they work with. We thought taking the Ferry to and from Martha’s Vineyard was a very fun part of the trip. Of course, we had the RV and so it served as a great conversation starter on the ride. We met quite a few people on the ferry who were curious about our RV being on board. But either way, there were lots of tourists and locals open to chatting during the 45-minute ride from Woods Hole across Vineyard Sound to Martha’s Vineyard. The cost to take our RV on the Ferry was $250. It was a little expensive but how many people can say they took their RV to Martha’s Vineyard and camped out? 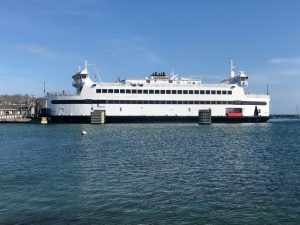 The ferry, which is run by the Steamship Authority runs from Woods Hole, MA on the mainland to either Oak Bluffs or Vineyard Haven. Don’t concern yourself with which location is better. They are both close to the campground so just pick whichever one fits your schedule the best. You need to book your reservation for the ferry as early as possible, especially if you are taking an RV. There is a max height requirement of 13 feet but most RV’s can fit on the ferry with no problem. Everything has to be shipped to the island so 18 wheel trucks get onto the ferry to make their deliveries every day. If you are driving an RV you can’t book online. You can use the link above to check out the schedule but you must call to make your reservation. The number for the Steamship Authority is (508) 477-8600 and they are open daily from 7:30 am to 4:00 pm. Below is a picture of our RV aboard the ferry boat on our way to MV! Honestly, we can’t wait to go back! We loved camping out at MVFC and the staff members were all friendly and helpful. We really enjoyed having the campground as a very inexpensive home base while we used our bikes along with the shuttle service to tour the island. While we were there we met lots of locals who were some of the nicest folks we ever met. And, they all have a cool story about how they ended up on MV. Many of their stories begin with, “I came to Martha’s Vineyard for a summer and never left” and we loved hearing all about them. We also met plenty of other tourists on the island in vacation mode and it was fun meeting them too. Thanks for reading this article. Have you stayed on Martha’s Vineyard or at MVFC? Please share your comments below! If you would like to contact us directly please feel free to visit our Contact Page to send us an email.